Ippoton – the Street of the Knights. This year around two million visitors will visit Rhodes. With its fine beaches, forested mountains, medieval castles, and frescoed churches – and eight months of virtually guaranteed sunshine a year – the largest island in the Dodecanese has become one of Greece’s most popular destinations. I visited in March, an auspicious month. On 7 March 1948, the last link in the chain establishing the modern Greek State was forged, when Rhodes and the Dodecanese were united with Greece. A part of Alexander the Great’s empire from 332 BC, for hundreds of years the Dodecanese had followed the fortunes of Hellenism – eras of freedom and prosperity interrupted by foreign invasion, but it was the Knights Hospitallers of St John, founded in Jerusalem during the First Crusade, who left an indelible mark. At the crossroads of nations and civilisations, the walled city of Rhodes, which the Knights began constructing shortly after their arrival in the early 14th century, encapsulates the turbulent history of the eastern Mediterranean. Overlaid on the sites of former bastions – from classical antiquity and the Byzantine period, added to by the Ottomans, reimagined by the Italians (who invaded Rhodes in 1912) – this a place where the energies and spirits of those who have gone before are ever present. Walking at night under a crescent moon, through the ancient Gate of Saint Athanasios (one of the eight gates of the Old Town) to my hotel is a breathtaking experience; a more dramatic introduction to the story of this remarkable citadel would be hard to find. Through the same arch, Ottoman emperor Suleiman the Magnificent is believed to have come on New Year’s Day 1523, his invading army having breached the Knights’ defensive line: the final victory in a bloody six-month siege. So ended the Knights’ 216-year control of the citadel and island, and so began nearly four centuries of Ottoman rule. In the shadows of this portal, under its limestone eaves, treading cobblestones felt underfoot for more than half a millennium, history here is tactile. My host is Anastasia Chiotaki-Mastromina, owner of Allegory Boutique Hotel. Anastasia leads the way to the ‘story’ she has been creating since 2012, the year she and her husband Nikos began to conceive a luxurious retreat: a place for renewal; a place of art, comfort and fine detail. As we talk, the reason for the hotel’s enigmatic title becomes clear. “The word allegory means a story that can be interpreted to reveal a hidden meaning,” says Anastasia, a former teacher born on the island of Karpathos, and whose Karpathian heritage (shared with her husband) underpins their creative spirit. 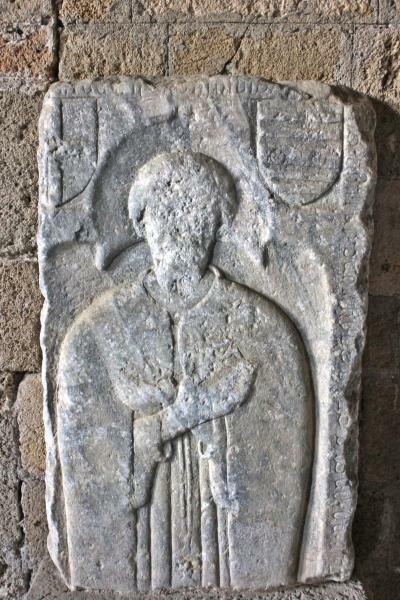 Knight’s tomb slab, 16th century. As a member of the Yades Greek Historic Hotels Group, whose mission is to celebrate and promote Greece’s cultural heritage by uniting hotels of exceptional historical significance, Allegory is a extraordinary example of that vision. Like the 18 other hotels in the Yades collection across Greece, the owners of Allegory are guardians of the past, as well as exceptional and sensitive hosts of the present, with their passions and personalities deeply embedded in the property. As many Karpathians have done before, Anastasia and Nikos emigrated to North America in the early 2000s (Canada first, then the US). As the hotel began to materialise more than a decade later, another story – which became intimately connected to the owners’ vision for Allegory – was revealed, when close friend and writer, Irini Vogiatzi-Haralambi began writing a Greek manuscript entitled Allegoria. It’s a tale of forbidden love between a knight and a local Greek woman set in medieval times, and the gift she gave him to mark their love: a blue pearl. The Allegoria story became a touchstone for Anastasia and the hotel. With its author’s untimely death in 2015, Anastasia is arranging for it to published in Greek, English, and French as a gift for her guests. Beyond the spiritual energy of the property itself, infused by the owner’s presence, the hotel is a remarkable feat of design incorporating the new with ancient architectural styles. 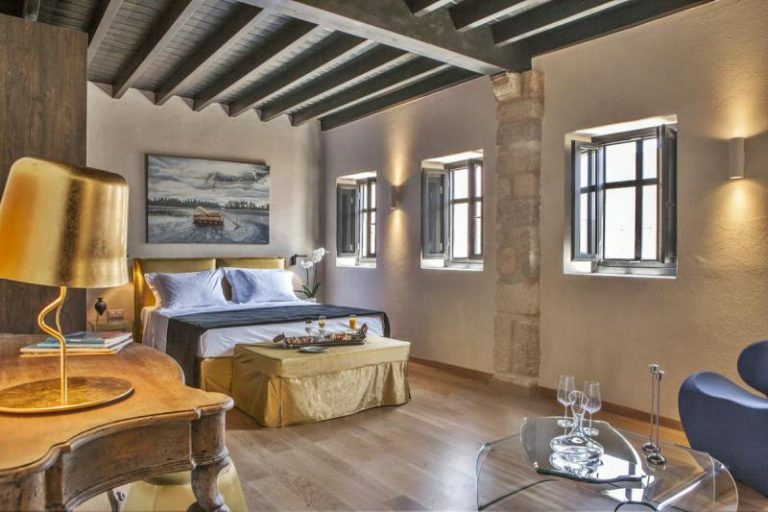 I stayed in Narcissus Suite, thirty-five square metres of elegant minimalist luxury on the upper floor, facing east. Subtle lighting, warm stonework, parquet floors, and even its own hamam make this a refuge to savour; a perfect base from which to explore. Narcissus Suite, Allegory Boutique Hotel. The morning after my arrival, as the sun warms the stones of the medieval city, I walk with Anastasia through the Old Town alongside one of Rhodes’ most respected historical guides – Dimitris Salahouris. The Archaeological Museum of Rhodes, housed in the former main hospital of the Knights is our first stop. Dimitri’s insights provide a deep understanding of the treasures on show, which include tomb artefacts from the ancient city of Kamiros, one of the three Doric cities of Rhodes, built in the 12th century BC, the site of which lies on the island’s north-west coast. One of the museum’s treasures – the tombstone of Krito and Timarista – is a landmark in the history of Greek art; the sculptor dared, for the first time, to present the anatomy of a woman in three dimensions, glimpsed through fabric worn by the two female forms. On the first floor, funerary slabs of the Knights, their effigies carved in stone beside their coat of arms, give a tantalising glimpse of the noblemen who held Rhodes between 1310 and 1522. 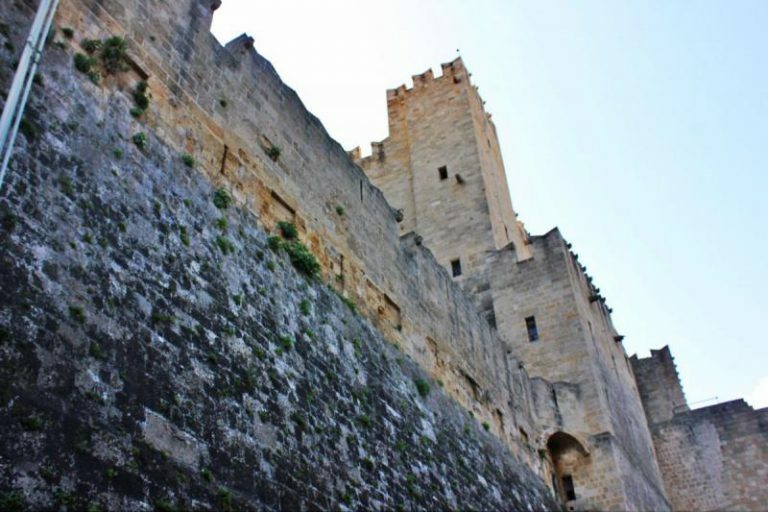 We head downhill, along the Street of the Knights, Europe’s most intact medieval thoroughfare, to the vast Palace of the Grand Master of the Knights of Rhodes. 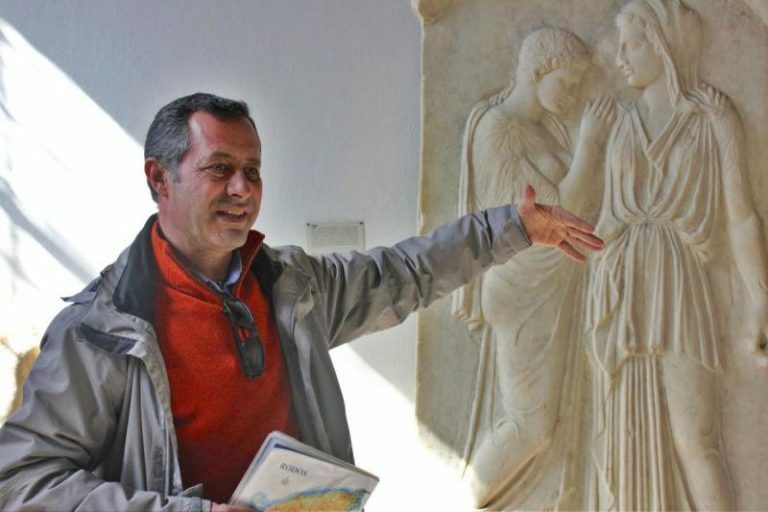 Rhodes tourist guide Dimitris Salahouris beside the tombstone of Krito and Timarista. Built by the Knights on the foundations of a temple to the sun god Helios and a later Byzantine citadel, today it houses a kaleidoscope of historic artefacts and furnishings. 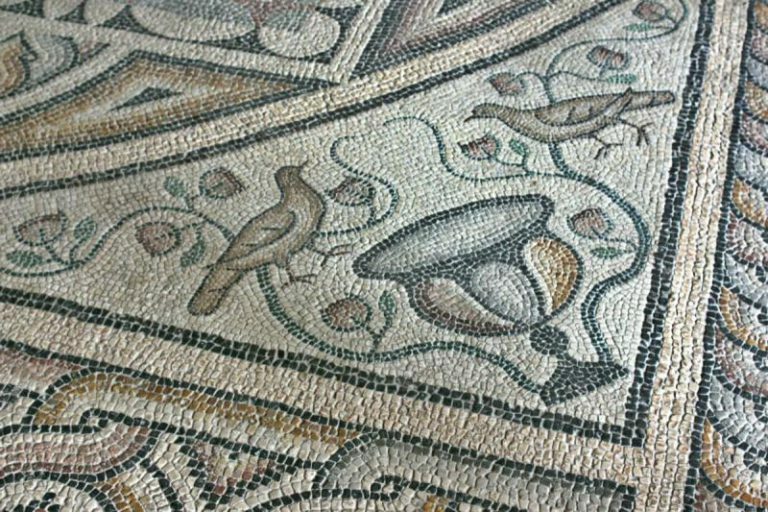 Exquisite mosaics created in Kos in the second century BC adorn the floors. Murano chandeliers hanging above hint at the palace’s Italian saviours. Largely destroyed by fire in 1856, what is visible today is the 1930s reconstruction of the palace, undertaken to create the summer residence of Mussolini and the Italian king Victor Emmanuel III. Rhodes’ history of invasion, of conquest and resistance – as it was in antiquity – continued in modern times. Our walk ends solemnly, in the massive dry moat that surrounds the palace, at a place most visitors pass by, unaware of its significance. Dimitris points to a pock-marked corner of the limestone wall, perhaps thirty metres long, with hundreds of indentions. They were made by the bullets of Nazi firing squads in WWII when executing Rhodian resistance fighters and Italian soldiers who refused to fight for the occupying Germans. Another story, another age, another sacrifice in freedom’s cause, in this place where history collides. Layer upon historic layer, a journey through this jewel of the Dodecanese is a revelation – a poignant, unforgettable exercise in time travel. Details of Kos mosaic, c 200 BC. A treasure trove of archaeological findings from the Dodecanese, from prehistoric times through to the Classical, Hellenistic, Roman, and Knights’ periods. Three galleries cover Rhodian history from the third century BC to the Ottoman conquest. The best views of the Old Town are from on top of the palace walls (noon – 3.00 pm). The city wall (four kilometres in total) was built in stages over two centuries. With its cosy antique-filled dining rooms, bougainvillea-draped courtyards and floral-roof terrace, Koykos is a much-loved institution in Rhodes Town. 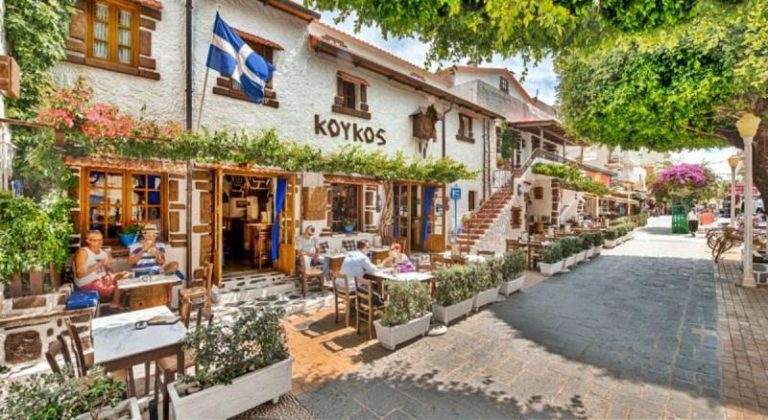 Famous for its wood-fired delicacies (a favourite is eggplant with feta and koulouria), homemade pies, and its own bakery, for a fun feast go no further than Koykos, for some of the best food in the Dodecanese. Diagoras airport is 15 kilometre from Rhodes Town. Aegean Airlines operates four services daily to Rhodes from Athens and one service daily from Thessaloniki. 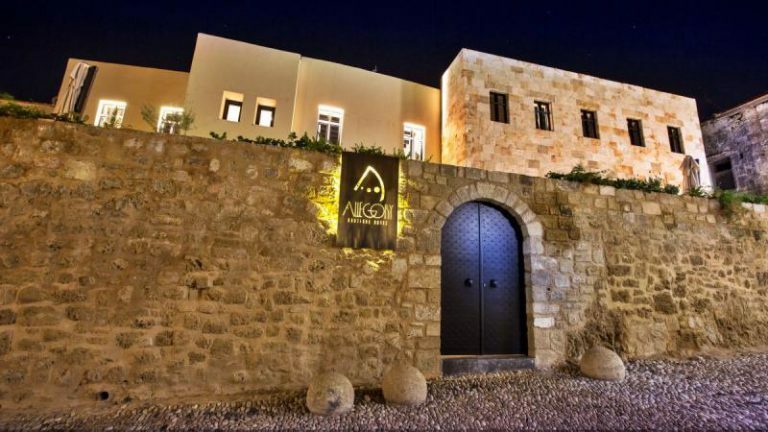 Michael Sweet was a guest of Allegory Boutique Hotel and travelled to Rhodes with the assistance of Aegean Airlines.